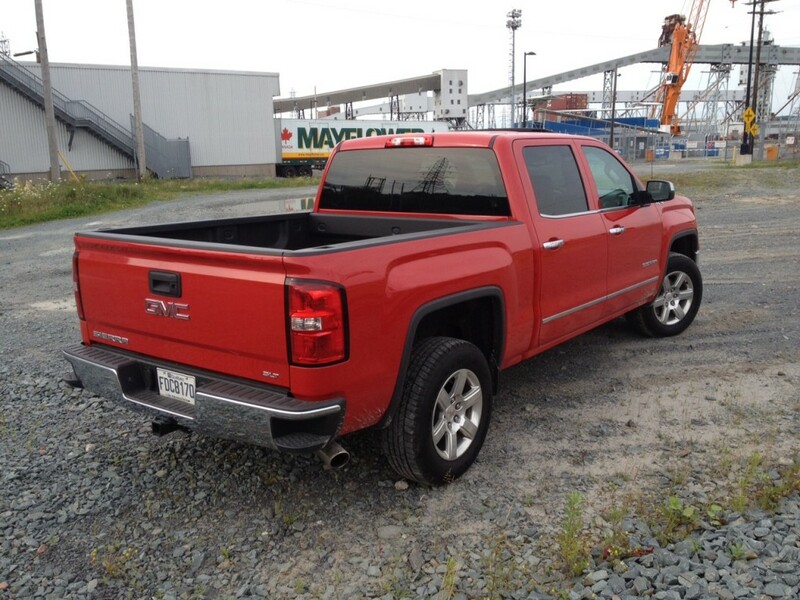 Possibly the most interesting segment within the auto industry is the half-tonne pick-up truck segment. Not only is it interesting because it is significant (half-tonne pick ups make consistently make up four of the top ten selling vehicles in Canada each month), but because the combinations within the segment are vast. You can get 2-wheel drive pick ups, 4-wheel drive pick-ups, double cabs, crew cabs, single cabs, varying bed lengths & transmission choices, different appearance and off-road packages and, of course, engine choices. The combinations are endless. If you’re a GM fan you even have your pick between different brands. 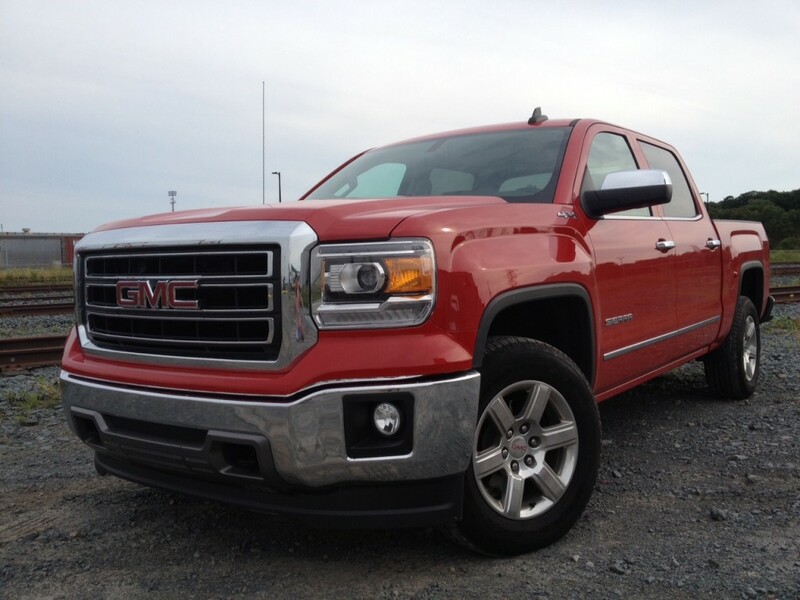 You can opt for the Chevrolet Silverado or the GMC Sierra. 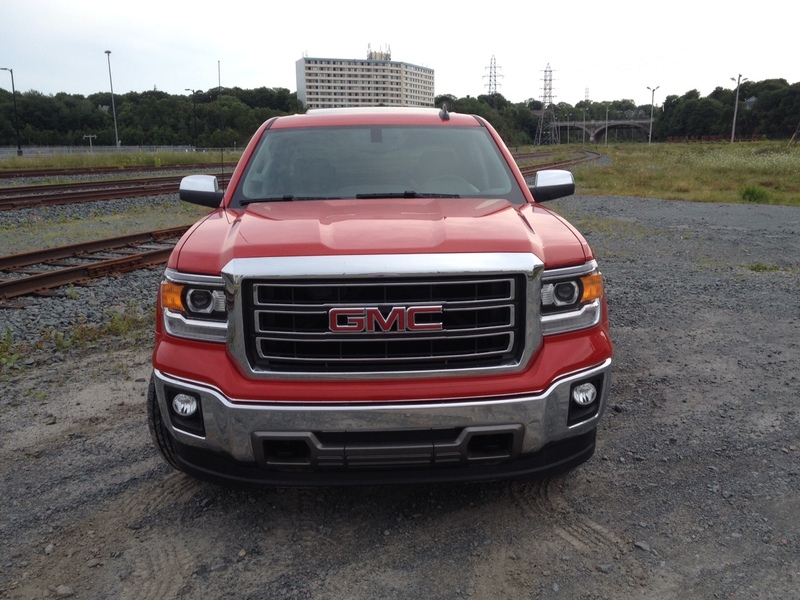 Recently, GM opted to send over one of its many iterations of the Sierra. 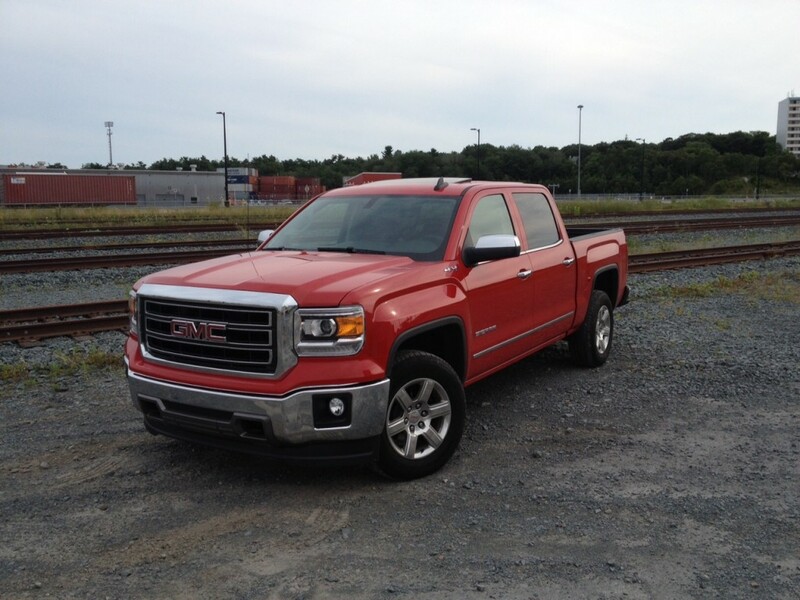 You may remember Car Driven’s review of the Sierra Crew Cab SLT a few years ago when the updated Sierra first debuted. It was a noticeable improvement but I cautioned that most wouldn’t be “blown away by the acceleration” of the 5.3 litre V8 fitted to the tester. Well, GM has upped the ante by sending us the bigger and more powerful 6.2 litre V8 – an engine that is essentially used in the modern day Corvette – to see if that might satisfy my apparent need to speed. But before we get to that engine, the Sierra’s exterior looks need to be addressed. I think we can all agree that the Sierra in general is a good looking truck. Some iterations look better than others, and I have to say, this particular iteration did not generate nearly the same amount of stares as the 5.3 litre SLT I had a few years ago. Perhaps it’s because this generation Sierra has been around long enough now that we’re all used to seeing it, or perhaps it’s the rather uninspiring and small looking 18-inch wheel design. The big chrome grille and chrome accented exhaust tip helped it from slipping under the radar completely (not to mention my tester’s fire red paint), but it was when you turned the engine over, bringing the 6.2 litre engine to life where people definitely noticed. Inside, GM hasn’t done much with the interior since I last saw it and that’s probably a good thing because the interior is quite good both in its functionality and quality feel. 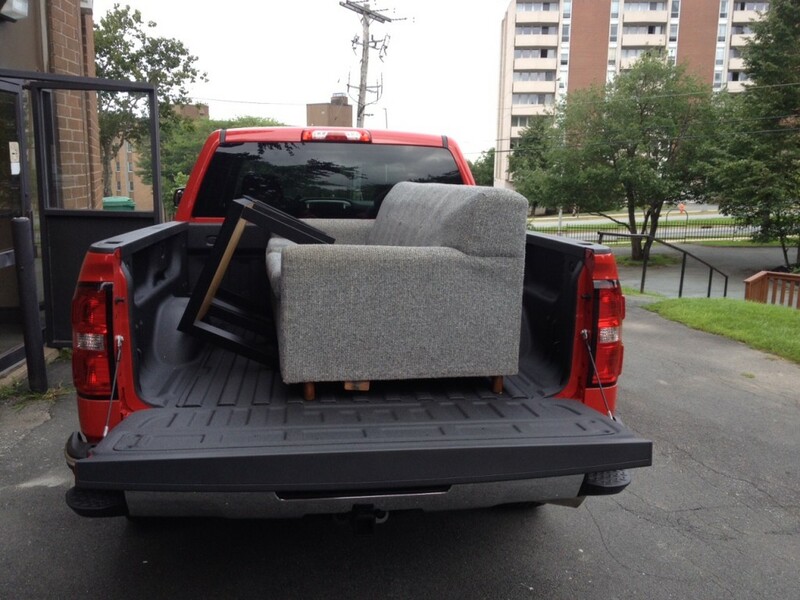 In typical work0truck fashion there is plenty of room for both passengers and objects. I’m pretty sure you can fit an entire laptop in the centre console, for instance. 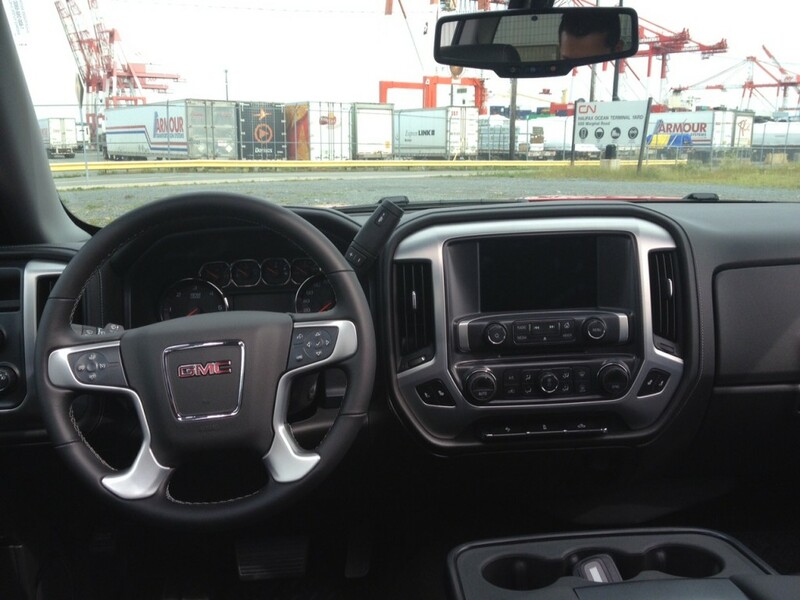 The layout of the centre stack is simplistic and while GM’s interface isn’t quite as good as Chrysler’s it still does the job and is relatively easy to get used to. GM did not fit an optional step bar to ease ingress and egress – something my mother would have appreciated since she struggled to do both – but once you get your body inside there is plenty of head, leg and knee room. 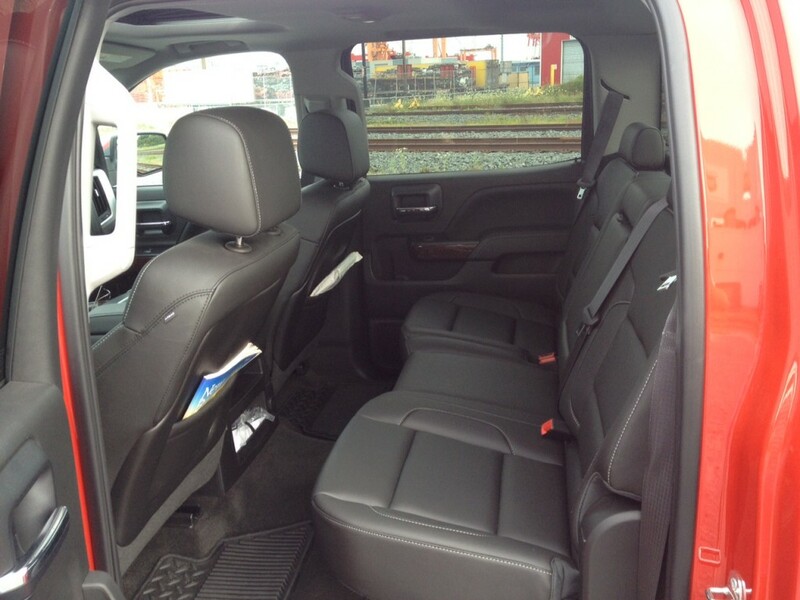 The rear seats can also fold upward in order to accommodate tall items. Since my tester was the Crew Cab, bed length was the shortest available, however it is still fairly useful especially with the optional tie downs fitted along with the optional bed lining spray. 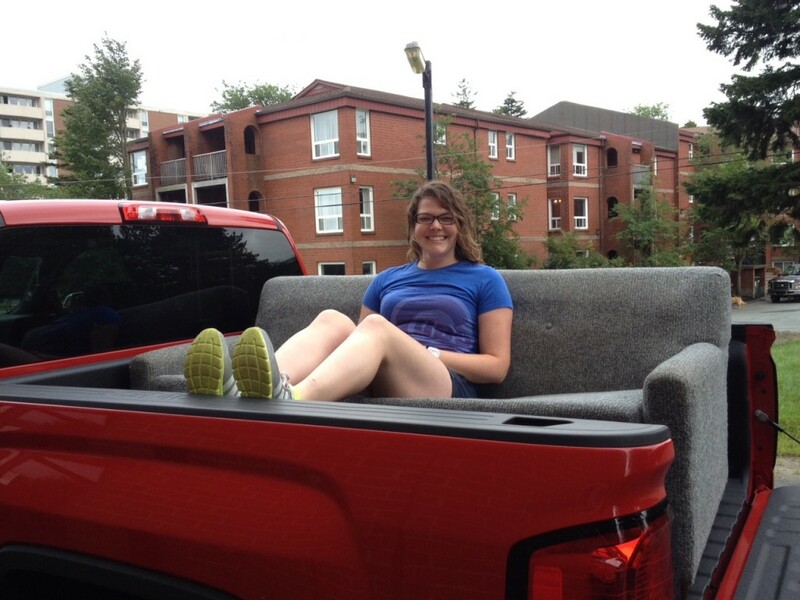 As you can see in the picture below, I used the Sierra to help my friend Robyn move a couch without issue, except for the fact that I may have done a bit of damage to my back while hoisting the couch, but the Sierra was happy to oblige. Now, let’s get to that engine. As mentioned it’s a 6.2 litre V8 producing 420 horsepower and 460 pound feet of torque. It should be noted that this engine cannot be fitted to regular cab Sierras and can only be fitted to double and crew cab Sierras if you select the higher trim levels, i.e this isn’t really an easy engine to get your hands on, depending on your needs. However, the end result is an engine that loves to growl and also loves to pull. The power difference is certainly noticeable from the 5.3 litre engine. Actually, that’s an understatement. This is a quick truck, capable of posting 0-100 times in the 5 second range. To put that into perspective, a BMW 335i usually posts numbers in that range. The 6.2 is fun too. The tail end loves to break free slightly whenever you attack the throttle from a full stop. The 6.2 is mated to an 8-speed automatic, which is still thankfully controlled by a column mounted shifter, however the automatic a bit dim-witted and unrefined. Shifts can generally feel clunky and sometimes it seems confused as to which gear it should be in. 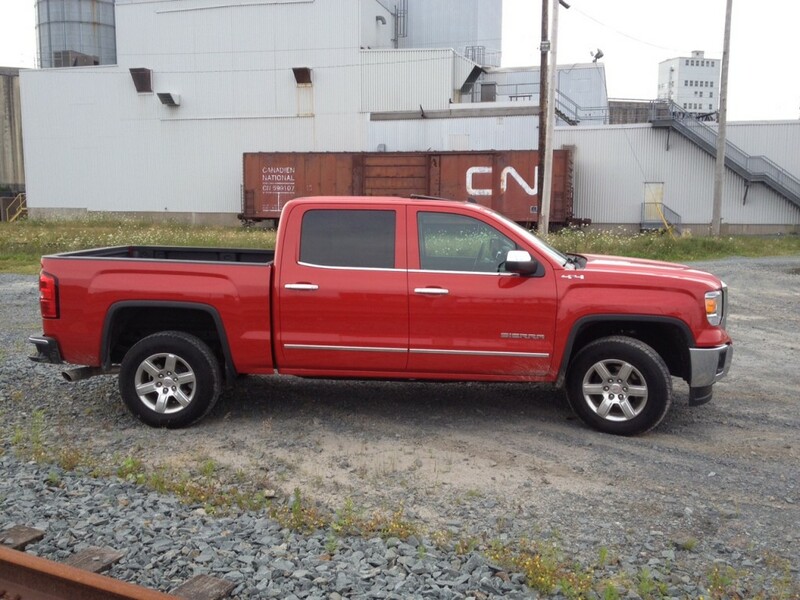 It’s not a completely useless transmission, but it does need a bit of work from GM. Obviously handling is never any pick-up truck’s forte, and the Sierra is no exception, however since the back end does like to break loose every now and again, cornering can actually raise the fun levels a bit. And once you’ve negotiated the bend you can step back onto the power and the rear will straighten itself out and off you go blasting away in a loud and fast manner. It’s brash fun, but it’s still fun nevertheless. But here’s where the fun stops; when you look at the fuel gauge. Officially, the Sierra 6.2 is rated at 16.3 L/100 kms city and 13.7 L/100 kms highway. Those aren’t impressive numbers in the first place. I drove 90% of my time in the city and returned, wait for it…17.9 L/100 kms. Yikes. For a comparison, I averaged 14.0 L/100 kms in the 5.3 litre Sierra. That’s not to say the Sierra doesn’t at least try though. It is equipped with cylinder deactivation which means, when it gets up to speed it can essentially go from being a V8 to a V4. The switch between the two is seamless and it happens more frequently than the driver realizes. To be fair, it was difficult to not take advantage of what is essentially a Corvette engine and thus the fuel consumption numbers really had a chance, but if you lived with this truck day to day, you would definitely be feeling it in your wallet. That said, it wouldn’t be completely out of turn to try to live with this truck day to day either. Assuming you take it easy on the gas pedal, this truck will tackle most daily duties with relative refinement and comfort. Pick-up trucks aren’t just rugged work horses anymore. They are a jack of all trades, and that includes being able to give your grandma a sophisticated ride to he weekly Bingo tournament (assuming you equipped your Sierra with a step bar). When you drive the Sierra normally as opposed to a yahoo, it’s not overly loud and it feels quite normal. As a truck, it is fantastic. It’s quick, it’s powerful, it can tow or haul just about anything and it’s decent looking, even if this particular iteration wasn’t especially exceptional. But let’s face it. You don’t want a 6.2 litre Sierra because it can tackle daily school or grocery runs in comfort and refinement and you don’t really care if anyone notices the styling of your truck anyway. 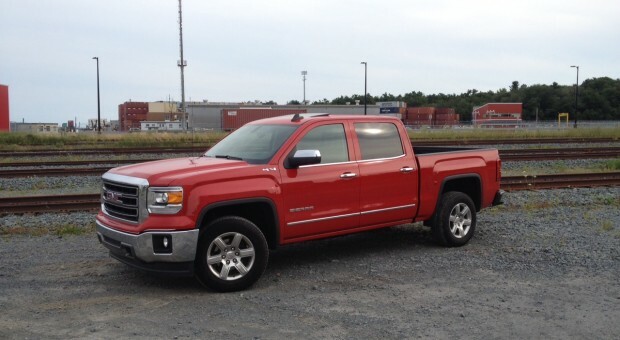 You want a 6.2 because it is the biggest engine you can get from the GM line-up. And it’s quick and it’s loud and it’s fun. Enough said. Mother Nature will hate you. Seriously. Your wallet will hate you. Seriously.